OMNET++ is a discrete event simulator framework provides various simulation environments with different networks. We offer B.TECH projects in OMNET++ include simulation with network and communication based projects for engineering students. We guide and support computer science and communication based engineering students develop their final year projects in OMNET++ simulation environment. We ensure OMNET++ with various network types and mobility model. We support testing and analyze various protocol and routing process in OMNET++ simulation. We provide sensor network composed of large number of small sensor device to ensure various environment measurements. We measure seismic, IR, magnetic, acoustic & video information are processed. Every device in sensor network is equipped with small processor and wireless communication antenna. We mainly use sensor network to provide high utility and gathered information accuracy. We implement vanet (vehicular Adhoc network) a special category of Adhoc networks from Springer papers. In vanet, we use address based and topology based routing protocol assign unique address to participate nodes. We categorize routing protocol in vanet as proactive and reactive routing protocol. In client wireless mesh network, router is not necessary because routers are established among clients as P2P. In this network we provide high level transmission. By this network, we send packet to leach destination through multi node. All traffic covers single network node. 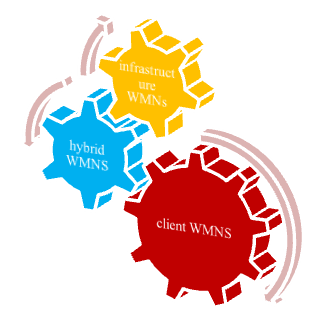 Every node in client WMN requires routing and self configuration function. We refer infrastructure wireless mesh network as backbone wireless mesh network. By this network it contains dozens of interconnecting clients we ensure connection among routers, internet by cables or wireless links. WMN uses IEEE 802.11 technology within various wireless technologies. We establish hybrid wireless mesh network with additional network structure and control long distance packet traffic. This network is a combination of both infrastructure & client wireless mesh network. Infrastructures in hybrid network ensure connection among mesh & internet whereas clients WMN organize network routing process. We provide support with all types of wireless mesh network by OMNET++ simulation.